Chris Avellone says he's tempted to try his luck with Kickstarter but isn't sure he actually wants to make another Planescape game. Chris Avellone is no stranger to Kickstarter. The creative director at Obsidian Entertainment is working with inXile Entertainment on Wasteland 2, the sequel to the classic 80s RPG that brought in nearly three million crowdfunded dollars earlier this year. Avellone knows his way around post-apocalyptica, too; he was a designer on Fallout 2 and the far-more-recent Fallout: New Vegas. Avellone said that Fallout is "much more limiting" than Wasteland, in part because of the need to maintain the familiar Fallout vibe inspired by 1950s sci-fi. "You can't lose that or you lose Fallout," he told GamesIndustry. "In Wasteland, that's one of the parameters that's removed, you can do a fun post-apocalyptic game and have a lot more freedom with what you want to do." Avellone expects the Kickstarter frenzy to slow as people grow fatigued with the idea and, perhaps more importantly, run out of money to throw at projects they like. But that apparently hasn't stopped him from kicking around the idea of a Planescape Kickstarter, which he described as a "very tempting" idea - but not necessarily for a Planescape game. "I think a better approach would be to ignore the D&D mechanics and respect what Planescape was trying to do and what the game did and see if you can do what Fallout did when it became the spiritual successor to Wasteland," Avellone said. "With Torment, I'd argue that the D&D base actually, in places, got in the way of the experience. It was a lot harder to make a game with those ideas in it with D&D mechanics. So much that we had to break a lot of them. We had to ignore certain spells, change up the class mechanic so that you can switch at any time you like by remembering abilities." "That was stuff that D&D didn't allow for, it was too restraining in some respects," he added. "If we did do a spiritual successor, then I don't know if we'd use the Planescape license or attach the mechanics, perhaps something that has a different feel to Torment." A theoretical Planescape 2 is an exciting idea unto itself, but it's Avellone's statement that the setting and the mechanics didn't really mesh that I find particularly interesting. It's true, and Planescape: Torment did break a lot of rules in order to accommodate its narrative, but I never found that doing so negatively impacted the game, nor I suspect did most other fans. 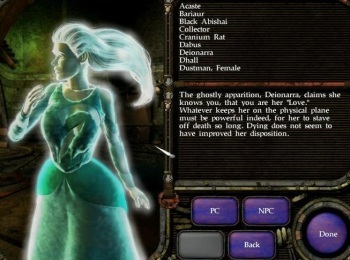 Would a Planescape-style game, rather than a real return to the City of Doors, be enough to satisfy gamers who have lusted after a sequel for more than a decade? With all due respect to Avellone, I just don't think it would.